On bonfire night we held this month’s Young Professionals ‘Thirsty Thursday’ networking event. This month we were delighted to hold it at former committee member Gus Bhandal’s new pub, The Stag and Pheasant on Lockhurst Lane. As I wrote previously, Gus has just left his 9-5 job working for Warwickshire Investment Partnership to take on his lifelong ambition of becoming a pub landlord. 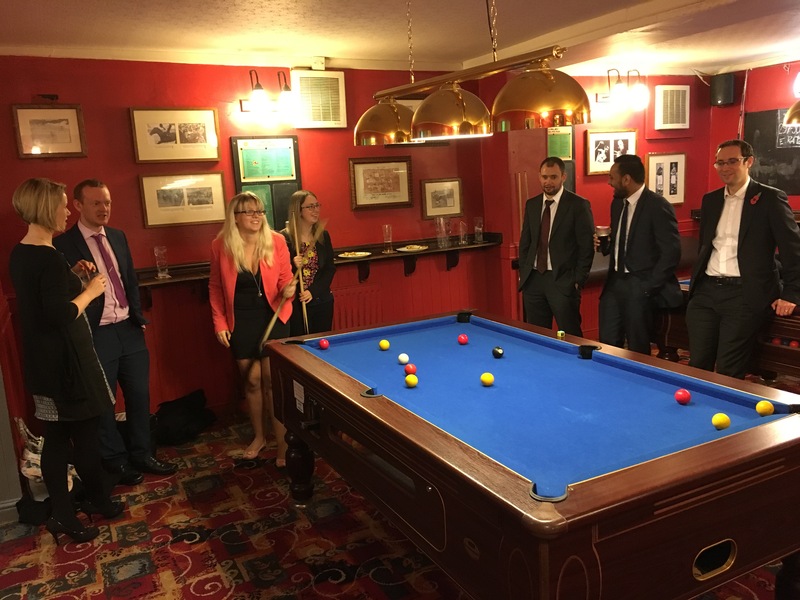 Everyone who attended the event was delighted to be supporting Gus’ new venture, and the pub looked great sporting three big screen TVs, two pool tables and a table football table. There were attendees from a wide range of Coventry and Warwickshire businesses including Burrows Scarborough, Mander Hadley and Cranfield, but we particularly enjoyed welcoming Alice from Stewart Fletcher Barrett to her first Thirsty Thursday event. Alice also won the champagne business card draw so we hope that will be incentive enough for her to come back to our next event. As well as being a pub the Stag and Pheasant also serves locally-renowned Indian food. Their signature dish is chilli cheese naan, and it was just as good, if not better, than he had raved. Gus looked very much at home behind the bar, and despite now working until 1am 7 days a week, he says he’s enjoying every minute. We very much miss him on the young professionals committee but are really pleased to see an old friend make a great success of a new business. Our next young professionals event will be our Christmas party on Friday 4 December at Le Bistrot Pierre in Leamington Spa. If you’re not on our mailing list but would like to attend, please email Holly Brain hollybrain@hcbaccountants.com as soon as possible for more information.